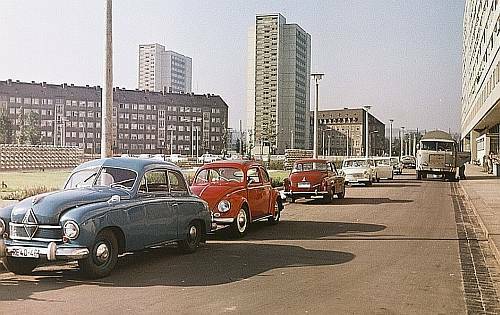 behind it VW Beetle „Ovali“ (1953–1957),then Skoda Oktavia (from 1959), Trabant 601 (from 1964) and IFA W50 truck (from 1965). Source: Deutsche Fotothek. Photo: Richard Peter. This file is licensed under the Creative Commons Attribution-Share Alike 3.0 Germany license.